Zebra Z4M and Z4M Plus labels - our Genuine Zebra labels for Zebra Z4M and Z4M Plus industrial printers are supplied on 76mm cores. The Zebra Z4M printer can use both direct thermal and thermal transfer labels. 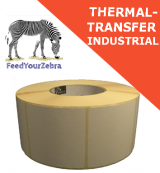 If you are using thermal transfer labels with your Zebra Z4M printer, you will need to use a thermal transfer ribbon to print onto the label - we sell Zebra thermal transfer ribbons for the Zebra Z4M printers here. The Zebra Z4M has a maximum label width of 105mm. The Zebra Z4M and Z4M Plus are 4 inch wide industrial label printers available with 203dpi and 300dpi. They have been replaced by the ZM400 printer but use the same labels and ribbons as the S4M, ZM400 and ZT200 series printers. FeedYourZebra.co.uk direct thermal and thermal transfer labels for Zebra Z4M and Z4M Plus label printers. If you are using thermal transfer labels, you will also need thermal transfer ribbons for the Z4M available here. Zebra barcode labels for Zebra Z4M printers ensure reliable, high-quality printing. Our Zebra Z4M direct thermal and thermal transfer barcode labels are performance-matched to Zebra Z4M label printers for crisp, dependable output. FeedYourZebra supplies only Genuine Zebra direct thermal and thermal transfer labels for the Zebra Z4M industrial printer. The Zebra Z4M printer has a maximum label width of 102mm and labels are supplied on 76mm cores - please be sure to select the correct labels for your printer. When using thermal transfer labels, you will need to use a thermal transfer ribbons to print an image. We also stock a range of thermal transfer ribbons suitable for the Zebra Z4M printer in wax, wax / resin and full resin formulations. Our Genuine Zebra labels are guaranteed to work with Zebra Z4M and Zebra Z4M Plus label printers.